When recently attending the Green Plumbers Conference in Las Vegas, I was struck with how far the Green Plumbers have come in the US since being brought over from Australia in 2006. I was one of 110 attendees from all over the country who participated in a very educational five days of intense training classes, and came away with a much better understanding of how to cope with water shortages that are now starting to show up in many parts of the country. During the course of the conference you begin to see how limited the Earth’s fresh water supply really is, and you also realize how large a part the Plumbing Industry will play in making sure everyone will have fresh water in the future. While at the conferance, I also received my certification to teach the Green Plumbers program, which I have been wanting to do for some time now. The Green Plumbers started in Australia with the advent of a very long and serious drought that still going on some 14 years later, and had the support of local governments, various industry members including manufacturers, as well as the Australian Greenhouse Office (AGO). The goal was to have the Green Plumbers advise and educate the public on how to conserve both water and energy, since the two go together. The Green Plumbers USA are now doing the same thing in our country, and I can only see them growing in leaps and bounds. Like their Australian counterparts, Green Plumbers USA is also collaborating with many different Agencies and Associations, City and County Governments, Manufacturers, and Water and Energy Utility Companies from all over the country. These include the PHCC, International Plumbers Union, P.I.P.E., Nexstar, and IAPMO (UPC) to name a few, and the list is growing. I do not believe the cooperation between all of these groups would have happened just a few years ago, but it shows just how serious this water and energy problem is becoming in our country. One thing I noticed was that when the subject of Climate Change was brought up, the room got very tense. People’s feelings run very deep on this subject both pro and con, and there was some heated discussion on the subject. When this was occurring, I determined that it really does not matter how you feel about Climate Change, the “Green” movement is firmly entrenched and moving forward at a rapid pace. Our industry is at the forefront of making a positive difference in people’s lives, all we have to do is step up and do it. This was confirmed to me, when we attended the Water Sense Show that was being put on in conjunction with the conference, and I saw row after row of new water and energy saving products on display. The show proved how many of the name brand manufacturers have really gotten on board with going Green, and have spent millions of dollars either retooling existing products, or developing new ones. There is no turning back now, as the die is cast. From a business standpoint, what I like about the Green Plumbers is that they train you to become advisers for your customers on how to conserve water, energy, and therefore money. This allows us to send our Techs into customer’s houses loaded with honest and valuable information, which will in turn help them while making our planet a cleaner and safer place to live in. This program is a perfect fit for Plumbers, and I feel we really need to take advantage of it. After all, we know about water and sewer systems, and we know how to install High Efficiency Plumbing Fixtures. We are invited into people’s homes, and therefore have access to their Plumbing & Heating Systems; all of which makes it a perfect storm for plumbing companies to provide a valuable service for their customers, while growing their companies. Becoming certified as a Green Plumber requires some money, time, and effort, and involves taking a third party exam. The course itself consists of a 32 hour five part series, which covers all aspects of conserving water and energy. The testing will then be given at the completion of the entire course, so it will behoove everyone to take it in a timely manner. In addition, there is a recertification every three years in order to keep current with all of the changes in the program that are sure to come. I suspect that only the better companies will pursue this effort, and only they for the most part will reap the benefits. I feel very good about all of this, as well as the future of our industry in general. The Journal of Commerce Online reports that Gene Huang, the chief economist with FedEx, thinks the economy is in recovery and could easily hit 3% GDP growth next year. This exceeds the 2.4% consensus forecast. Based on Huang, Morgan Stanley analyst, William Greene advised investors that the concensus was "far too conservative." While he believes the economy will exceed current expectations, Huang does worry that consumer angst may slow growth below the average recession recovery rate of 5.4%. Consumer recalcitrance may even lead to a "W" shaped recession. Counterbalancing that potential is the stock market's recovery, which to date has restored $4 trillion of household wealth. Worried about the economy, consumers have increased the savings rate to 4%. This is resulting in $400 billion of increased household wealth each year. Thus, consumers have the wealth to spend. If they regain the confidence to spend, growth would be robust. Whatever the initial cause(s), it appears that any continuation of the recession or economic anemia moving forward is a crisis of confidence more than cause. Is HVAC the Best Sales Job in the Country? Auto industry analyst Ed Wallace doesn't come out and say it, but when he notes that financial sales incentives for new car salespeople are about half of what they were in 1975, he implies that reduced compensation has had an adverse impact on industry sales professionalism. Read Ed's column here. Selling cars is a challenging job, but not more challenging than, say... selling air conditioners. Car salespeople deal with buyers who walk onto the car lot with a mix of apprehension and antagonism, but also with desire. 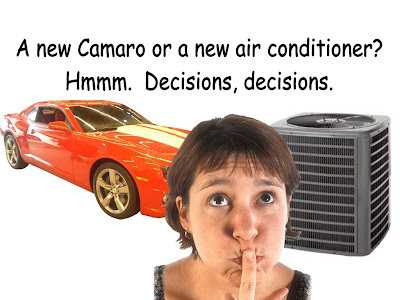 With HVAC, the buyer's desire is certainly less and maybe missing altogether. Plus, the location of the HVAC sale is the buyer's home turf. And, HVAC financing programs aren't as good. In contrast to the auto industry, the typical HVAC company doesn't have a financing manager who works with 20 different lenders to get C-credit prospects financed. Yet, in contrast to the car industry, HVAC sales income has increased over the last 20 years. With industry standard commissions of 8% to 10%, company advertising, company generated leads, and escalating prices (thank you government) leading to fatter commissions, selling HVAC may be one of the more lucrative sales jobs around. Thomas Sowell has been called "America's leading intellectual" and with the passing of Milton Friedman, is considered by many to be the nation's top economist. To those of us who view both intellectuals and economists with a skeptical eye, Dr. Sowell is a reminder that worthy individuals remain in each group. "And then what will happen after that?" Professor Smithies asked. As I analyzed how the further economic reactions to the policy would unfold, I began to realize that these reactions would lead to consequences much less desireable than those at the first stage, and I began to waiver somewhat. And then what will happen?" Smithies persisted. By now I was beginning to see that the economic reverberations of the policy I advocated were likely to be pretty disasterous-- and, in fact, much worse than the initial situation that it was designed to improve. Simple as this little exercise might seem, it went further than most economic discussions about policies on a wide range of issues. 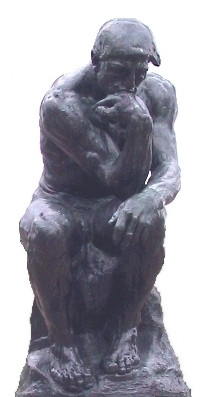 Most thinking stops at stage one. While Dr. Sowell is speaking to public policy, his advice applies to most management decisions. In fact, it applies to most life decisions. Much decision making is reactive. We're presented with a problem and formulate an action in response. However, the response results in other consequences, some of which may be undesireable. Dr. Sowell advocates thinking through the immediate consequences (stage one), and then thinking through the consequences to the consequences (stage two) and their consequences (stage three). As you face a management decision, keep asking yourself, "And then what happens?" Most service company owners came up through the field. Earlier in their careers they worked with their hands, solving technical problems. In field service, one learns the pitfalls of stage one thinking the first time a symptom is corrected while the underlying problems remains unaddressed. The result of this type of stage one thinking is a callback, with all of the stress, irritation, expense, and embarrassment that accompany it. It doesn't take many callbacks before one slows down and starts thinking problems through. Management and marketing problems are no different than technical problems with regard to the need to think beyond stage one. The consequences, of course, may be far greater. When you're faced with a decision, stop and ask yourself, "And then what will happen?" It is time to "Just Do It"
I was sitting in a hotel restaurant in Nashville, at breakfast the Saturday of Comfortech. There were a few contractors who were eating but many had left and were on their way home while there were still two “learning” sessions that day (missed opportunities for them). I was by myself and had finished reading the newspaper; my ears were perked to several of the conversations that the contractors were having with associates at adjoining tables. It was no surprised that everyone that was just overwhelmed by the new ideas that they had received. They were fascinated by the success and growth of Morris-Jenkins Contractor of the year. They focused on the key points from earlier classes and they talked about the different things they learned at the social events from other peers and felt that it provided them with a wealth of insights. Then it came, after all of the positive they had heard and learned the “Buts” and excuses started. For every good thing they talked about, they came up with a reason why these ideas would not work. · We do not have or can not hire a person to do that. · My customer will not accept those changes. Time after time I heard a great idea extinguished with a belief of an untruth. People who had spent thousands of dollars to attend this meeting of some the best contractors in country walking away thinking they could not achieve greater success. Have we been listen to the news too long where the negative message is the rule and the positive one is passed off as an aberration? My favorite was “I am just not ready”. Do you think that the auto dealerships that were closed by GM and Chrysler were ready? My point is change is better when we decide to do rather than when forced upon us. It’s time to take and Embrace the Nike mantra and “JUST DO IT”. · You only need one reason to succeed and overcome obstacles and barriers “JUST DO IT”. · It’s waking up with a focus that anything you believe in or conceive can be achieved “JUST DO IT”. · Every journey starts with a single step and they do not require large strides “JUST DO IT”. · Start with small ongoing step or increments to achieve the goal you are looking for “JUST DO IT”. · It requires endurance and persistence, as life and running a business is a marathon not a sprint “JUST DO IT”. · Once you start it, you finished it, you set milestones for way points and you hold to own deadlines. If you fail to meet your deadlines you impose on your self, then those you impose on others will be missed also “JUST DO IT”. · Celebrate the wins no matter how small, no matter who it is “JUST DO IT”. Change is always difficult, but is more frustrating when it pushed upon us. I had the opportunity to share with contractors last month the benefits of social networking and also some great offerings with based upon “cloud computing” better known as Software as a Service (SAAS). We showed people how to leave behind Microsoft and email servers and get access to products at a fraction of the cost. Professional tools that are now accessible to 3-10 man shop. We also shared how social networking cements a relationship with a client and keeps them loyal. All were pretty nifty things and to my surprise very much unknown to majority of attendees. There are many small steps that can be taken, most at low cost and little effort. Some actually will save you money on software. This was one idea, but there were ideas on sale person recruiting, Marketing in conjunction with a social cause, Building and system performance, Private labeling just to name a few. You also will have ideas and opportunities pop up at dealer meeting, Local Trade association and even chamber meeting. Do not miss the chance to build your company up to be one step ahead of the competition. Just pick one thing and “JUST DO IT”. After you have that one going well time to “JUST DO IT” again with another idea. In many cases you have nothing to lose as the ideas already have a proven track record. All this drove home and reinforced what I had seen and heard at lunch the day before. I had sat down with Mark Matteson (author and speaker http://bit.ly/BhgS3 ) and we had a contractor sit down next to us. We asked him, which was the best class he had attended. He said the one service agreement was great, but he could not implement any of the ideas for fear of losing customers. He stated that when he went to a prepaid service program he thought he had lost 200-300 clients, because he requested payment in advance to get the best price. We proposed that he considered a tiered service contract program, (good, better, best) and explained it to him. To which he said it would not work for him because he was not comfortable with it. Mark then ask him to fold his arms in front of him, ask him to note which arm was on top. Then Mark instructed him to fold his arms again but with the other arm on top. Mark asked him how that felt, the response was uncomfortable, ask him if there was anything that was really different between the two position other than comfort and the answer was no. The point is that you can change, it is not going to be comfortable, it will take effort, and you will make mistakes and sometimes lose a customer. In the long run you can become a better business person and more successful. You have to choose to do what others fail to do. Accept that you have to be uncomfortable from time to time to make the changes. After learning that I would speak on branding at an international construction conference in Istanbul, I proudly informed my family about the honor. My 19-year old daughter was non-plussed, but immediately declared that I needed to try the coffee. "Turkish coffee is the best in the world," she declared. "Everyone knows that." Well, *I* didn't know that. So I filed this piece of useless information away and didn't think about it until months later when I arrived in Istanbul a couple of hours ahead of Mark Matteson. Mark Matteson, author of Freedom From Fear, Freedom From Fear Forever, and the forthcoming book, A Simple Choice, was the conference keynote and responsible for my invitation to speak. The invitation was a surprise. One day Mark called to ask if I would be interested in speaking on branding at a construction conference in Istanbul. "Istanbul, Ohio? Sure," I said. Mark Matteson is one of the nicest people in the world. He always finds complementary things to say about people. I wondered what I did to cause Mark to call me a turkey. After a moment of silence, he clarified, "You know, the country, Turkey?" "Uh, yeah. Right. The place in Europe." "And Asia. It's on both continents." Mark said, "The people running the conference need a speaker on branding, but don't know anyone who knows about both, branding and construction. They asked me if I knew anyone. I thought of you." "Branding in the construction arena isn't a big field," Mark added. "In fact, you're the only person I know who can cover both." Whatever. I was still honored to speak at the conference, even if by default. The day finally arrived when I would fly to Istanbul via London. It's a long haul. I boarded a plane in Dallas and arrived in London the next morning. I had a few hours to bum around Heathrow's massive Terminal 5 (the largest free standing building in the UK) before hopping on a jet for Istanbul, on the other side of Europe, 1500 miles away. When I fly to Europe I try to stay awake during the flight and first day. When I turn in the first night, I'll sleep soundly and will wake the next morning, largely without jet lag. By the time I got to Istanbul, got my luggage, and left security it was early evening. With the time zones, I had no idea how long it had been since I slept. The conference host met me at the security gate. Mark was scheduled to arrive a couple of hours later. The host asked, "While we wait, would you like a coffee?" "Turkish coffee is the best in the world." Like Pavlov's dog,I could feel saliva form in my mouth over visions of Turkish coffee. "Sure!" Starbucks? Right in the middle of Istanbul's Ataturk Airport. And not only that, there are 73 Starbucks scattered across Istanbul. To get to the Starbucks, we walked past a Gloria Jean's coffee house. There are 30 Gloria Jean's in Istanbul. Coffee has been a part of Istanbul life since the 16th century. The Turks are quick to note that their's is a "coffee culture." So what gives with Starbucks? Moreover, the Starbucks were serving Christmas blend in Starbucks' Christmas cups. Turkey is 95% Muslim (though Istanbul, at least, is very secular). Wow, I thought. This is the power of branding. Later, I did try authentic Turkish coffee. It was good, very good. It makes Expresso seem like decaf. What I especially liked was all of the ceremony and tradition surrounding it, such as the need to drink water to clean the palate before drinking the coffee, the need to slurp the first few sips, the lore about the way the coffee is presented (lots of hidden meanings), the fortune telling from the grounds, and so on. The tradition and heritage surrounding Turkish coffee made the ubiquity of Starbucks curious. As a rule, local brands trump national brands in their markets. This is especially true for brands with a service component. After all, service is personal. It involves human interactions. It involves relationships. I was still trying to figure out how Starbucks managed to build its brand presence in Istanbul a few days later when it was time to deliver my speech. Speaking in an international environment is a challenge. Most of the audience is wearing headsets, listening to translators. Speakers are urged to slow down for the translators. This is difficult for me. I tend to speak fast. Humor doesn't always translate. Jokes guaranteed to bring applause in the States may bring crickets in a multinational venue. Stories, however, tend to work in any language. I opened with the coffee story. "That," I said, "is the power of branding." Given the cavernous size of the room, the blare of the studio lights, and the delay for translations, it was hard to tell if anyone was following the story. I paused for a second and added without thought, "But I like Turkish coffee better than Starbucks." The room erupted. It was the most applause the staid, stuffy contractors, engineers, and architects gave anyone all day. I realized that while Starbucks may have bought locations it hadn't trumped the local Ottoman coffee house brands after all. After I returned home, I learned that every Starbucks in Istanbul offers Turkish coffee if asked. Also, Starbucks is operated by a local company in Turkey under license to the Seattle chain. Like the domestic Starbucks, the Turkish locations try to build local identities and relationships through the baristas who work in the cafes. So while Starbucks is international in scope, it tries to act local in practice, which is a good lesson for every company. 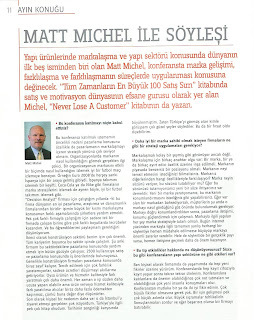 The company has done well in the Turkish market, but mostly among students, who consider it trendy. I think the chain also benefits from its American identity. 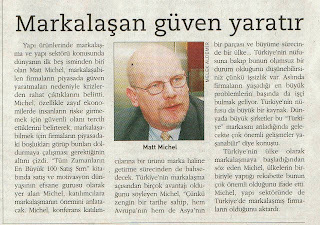 The Turks seemed to regard America and Americans well (as long as no one brings up the century old Armenian issue). I also think as a visitor I underestimated the strength of the local brands. It's hard to estimate the loyalty to the thousands of centuries old coffee houses tucked into out of the way streets and alleys carrying Turkish names. It's easy to see the green Starbucks signs. One of Jeb Blount's recent Sales Gravy podcasts struck a nerve with me. It's the perfect description for using a weak economy to surge past your competition. Blount described a pair of cars driving down a highway at a high rate of speed. One car is miles ahead of the other. The second car is driving a little faster and slowing closing the gap, but the distance is far enough and the first car is fast enough that it will take a long time to catch up and pass the leader. Even so, it's uncertain the second car will pass the leader. The leader could accelerate. The second car's rate of speed could slow slightly. Thus the gap between the two may narrow, hold, or grow. However, the tough economy, like a heavy storm, slows all cars. The leader, fearful of driving in these conditions, slows, and may even pull over and stop. This opens the possibility for the follower to surge ahead and pass the listless leader. When the storm passes, the former leader will have to regain momentum and play catch up. He may never catch up. Today's economy is like driving in the storm. Many of your competitors are so afraid of hydroplaning and spinning out of control that they pull over and try to ride out the storm. This creates an opportunity for you. Take advantage of it! Do not take your foot off the gas. Don't drive your company wildly, but don't slow down out of fear of what might happen. The economy is too resilient to stay down for long. Despite state and federal policy blunders (e.g., spending wildly on transfer payments rather than infrastructure investments, raising the minimum wage, increased trade restrictions, increased regulation, tax increases, flat out stupid energy policy, a climate of uncertainty, etc. ), the economy is still growing. No downturn is permanent. This one will not be an exception. While it may not feel like it, all economic signs point to a slow, gradual recovery. Remember, unemployment is a lagging indicator and will not start to fall until the recovery is well underway. Now... right now... today is an opportunity to surge past your more fearful, conservative competitors. You may not encounter another economic climate as favorable as this one for aggressive individual company action for decades. Take advantage of it. Surge ahead! Franklin Roosevelt has been lionized by historians who lived through the New Deal, notably Arthur Schlesinger, Jr. Many of the historians with memories of the New Deal have passed from the scene. Now, a new generation of historians and economists are taking a dispassionate look at Roosevelt's policies. In terms of pure economics, many of today's historians and economists are coming to different conclusions about Roosevelt. While he was preceded by the disasterous policies of Hoover (a true incompetent), his own policies not only failed to end the Great Depression, but extended and deepened it. Burt Folsom is one of the historians who is reassessing Roosevelt's policies. Recently, he wrote a book about Roosevelt's economic policies called, "New Deal or Raw Deal?" For an academic, Folsom is highly entertaining. The following videos about his book are from a lecture that appeared on C-SPAN." In time, I believe Roosevelt will be reassessed as one of the worst presidents in history based on his economic policies. Yesterday, I attended the West Coast Green Tradeshow in San Francisco, and it was fantastic. The show was held in two huge buildings, and featured hundreds of booths and displays. These included many different kinds of Green Building Materials, Furniture, Photovoltaic and Hot Water Solar Systems, as well as Electric Vehicles, and Heating and Cooling Systems. In addition, there were many different types of Plumbing Fixtures; including a very clever little add-on dual flush water system that sits on top of a standard flush Water Closet lid. In another building, there were on-going “Green” workshops and seminars all day long. This was the first day of a three-day show, and it was absolutely packed with people on a Thursday. In fact, we had to drive around for 30 minutes or so too find a parking place. I know the event will have many thousands of visitors by the end of the three day show, and I would assume most of whom are either already “Green”, or will be going Green in the future. This was not a free event, as it cost $20.00 to attend for one day. These people are serious about the Green lifestyle, and are willing to pony up their money to prove it, as well as the inconvenience of very limited parking which required sometimes walking several city blocks to reach the show. As I walked around checking out how many new and innovative products were on display, I thought how about how great this country really is. I am so tired of hearing about how we are behind everyone else in the world when it comes to having new ideas and creating new products. Granted there were many foreign products displayed, but there were many new and innovative American products presented as well. I really feel the Plumbing, Heating, and Cooling industry, which has been on the cutting edge of Green Technology for years, is in a great position to become one of the real leaders in this huge new “Green” industry. Any business that does not get on board and start participating in this new way of life, is going to be left behind very quickly. I am also going to be attending the Green Plumber series of five classes next week in Vegas. There are 120 people signed up too attend the weeklong event, and they will be getting all five of their Green Plumbers certifications by Friday. Having 120 people show up in a recession, should prove how valuable being certified as a Green Plumber really is too these people. While I am there, I am also going too receive my certification as an instructor for Green Plumbers, which I am very excited about. Our local PHCC Chapter is sponsoring my opportunity to become certified, which will provide another benefit to its members, as well as other plumbing companies in our area. I want to start teaching classes at night or on weekends, which will allow employees to become “Green Plumber” certified and not miss work during the day, which is a real issue for many people. The world's greatest mechanic, if he's gruff, rough, and rude, is unfit to work in residential service. In 2002, Texarkana contractor, John Price rebranded his company. After a trip to Maui, he changed his company name from "Price Service Company" to "Aloha Aire." The new name spoke to the market about island breezes, comfort, and paradise. It promised benefits. Changing a company name is not a casual move. If the existing name has equity in the market, the move should be made slowly. John's decision was easier because his company was relatively new. He established it just seven years earlier. Plus, he put more effort into building equipment manufacturer brand equity over those seven years than in building equity for his own company's brand. If John had 70 years of local presence rather than seven, he probably would have hesitated more. As it was, he didn't have much to lose. Still, John proceeded methodically. He sought the council of friends who owned businesses. For months, he and his wife Marilyn considered the change. Then, he acted. John launched Aloha. At first, he tried to operate both old and new brands, but quickly dropped that idea. Marilyn drafted a letter to existing customers explaining why the company was making the move. If nothing else, employee and owner enthusiasm for the new brand won the day. They were excited and got the customers excited. Over time, the Aloha brand has grown and established a position. Aloha Aire is a fun brand. Technicians wear Hawaiian shirts with embroidered company logos. Reach John's voice mail and he answers, "Aloha." In time, John dropped the manufacturer identity entirely and focused exclusively on the Aloha brand. Today, he's even branded his own line of heating and air conditioning equipment through the Retail Contractor Coalition. 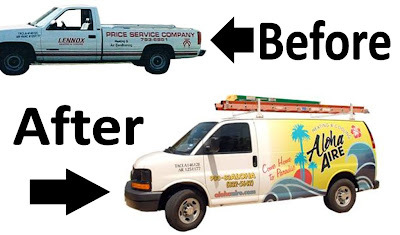 Shortly after rebranding, Aloha Aire's local brand awareness began to exceed Price Service Company's brand awareness. It's continued to grow by leaps and bounds. This shouldn't be a surprise. Look at the trucks. If the shipping company DHL could build a national brand awareness of 60% by 2007, largely on the basis their fleet of delivery vehicles, how much brand awareness can John build for Aloha? Certainly it's more than he built when the Price Service Company brand was subordinated to an equipment manufacturer's brand. Aloha's brand promise is "Come home to paradise." And the company delivers. Angel Zapata exposed a plagiarist at his A Rage of Angel blog. Having experienced the same, I understand his feeling. I can even empathize with the fact that Zapata admired the guy's work before he discovered it wasn't really his. Been there. Done that too. Like most plagiarists, the guy Zapata uncovered is a repeat offender, a serial plagiarist. People who do this are fundamentally lazy, dishonest, and unimaginative. They don't suddenly become industrious, ethical, and creative. Thus, they steal again and again. I've got to believe that intellectual property thieves eventually get found out and, at the very least, their reputations are tarnished. If they write fiction, they only hurt themselves and their publishers. Zapata contacted the publisher, who initially defended the plagiarist. "I have known Richard for over a decade and do not believe it possible for Richard to be morally capable of such an act," wrote the publisher to Zapata. "As a person with a great respect for the law and with such a love of literacy, I do not believe this is something he could commit knowingly, if at all." Regardless, the publisher took down the site. A few years ago we caught someone sending plagiarized material to the Service Roundtable for us to publish. Once alerted, we took it down, noted the copyright violation, and linked to the original author's work. Anything we were in doubt about simply disappeared. Only work we were convinced was original remained. We acted fast, proactively, and notified the original writers what happened, what we did, and whether there was anything else necessary. We made sure we were covered. I worry, however, about business owners who rely on plagiarists' work. If caught, the copyright holder will go after the business first. Remember, the business has the deeper pockets. The business owner may try to defer to the plagiarist, but since plagiarists are dishonest by nature, don't expect them to take one for the client. Expect the plagiarst to disavow all knowledge, leaving the business owner high, dry, and under siege. Lynn Frazier at the Writtenwyrdd blog, pondered about Zapata's discovery. Frazier asked, "Does the internet make plagiarism more common, or simply make it easier to find?" Personally, I think it makes it both more common and easier to find. In the last year, a contractor showed me material a well-known consultant wrote. I could swear I was looking at my words. As it turned out, I was. The consultant was quoting a marketing manual I wrote in 1995 under copyright to my employer at the time. Because it was hardcopy and not electronic, the text wasn't verbatim. The consultant couldn't cut and paste, so the work was summarized. 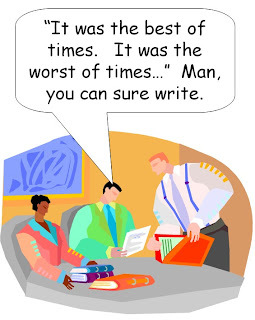 Summarizing took less effort than retyping word-for-word. Point after point after point was copied. Dollar amounts, when present, weren't changed. The manual included some off-the-wall ideas and honestly, some of them were pretty bad. The plagiarist copied good and bad ideas with equal vigor. If anyone looked at a comparison, there would be little doubt the original work was plagiarized. If you used an Internet search engine and searched phrases from the plagiarist's document, you would never find the comparison. For one, the manual isn't available on the Internet in electronic form. For another, the phrasing differs slightly. I only noticed the plagiarism because I was the original author. A select group of contractors who read the manual and saw the consultant's work might pick up on the similarities, but might not. It's been a long time since I wrote the original manual. My old employer doesn't even use the manual today (though the plagiarist apparently does). I believe the Internet makes plagiarism easier due to the cut and paste opportunities. I think it also makes plagiarism easier to detect since exact phrases can be searched. As a business owner, it's incumbent upon you to check the work of your employees, contract writers, and consultants from time to time. Pick unique phrases. Load them into a search engine and see what pops up. You might need to search through a number of pages and even then, you might not catch everything, but you'll stop enough to give you peace of mind. I know. I do it regularly. I also catch enough intellectual property theft among contract writers to keep checking. I was encouraging a contractor to start a blog for her business yesterday. She was stumped by the subject matter. She knew that geekspeak about her products and services would bore customers. I told her the purpose of a blog isn't to shout product information at customers. It's to build relationships. And then, every so often (but not too often), make a special offer or directly promote the company. Write about the history underlying holidays, holiday parties, profiles of people, holiday jokes, etc. Any item listed can be the source of one or more blog posts. And don't forget pictures from the community, inspirational videos from YouTube, heartwarming stories you receive by email (source or rewrite them), and so on. And then there are all of the blog posts you can make related to your industry, the products you sell, and the services you offer.